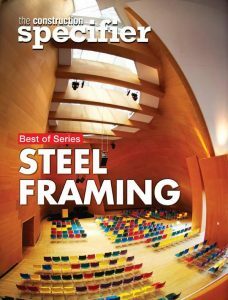 The Construction Specifier has announced the next installment in its series of free, downloadable e-books—a technical exploration of aspects related to steel framing. Cold-formed steel structures have the potential to deliver high-efficiency building designs by utilizing minimal material and advanced geometric shapes in structural members. Until recently, standards focused on design of the individual cold-formed steel structural members—making it difficult for designers and engineers to take full advantage of the capabilities and benefits of cold-formed steel members working together as a system. Addressing this issue, AISI standards improve on their previous editions by introducing a more comprehensive and useful suite of standards for professionals. These standards are intended to be adopted into the 2018 model codes, including the International Building Code (IBC) and National Fire Protection Association (NFPA) 5000, Building Construction and Safety Codes. Complex concepts envisioned by contemporary designers are being translated into buildable structures by a new generation of master builders. The differences, however, are today’s building materials can be considerably lighter weight than stone masonry of yore, and the craftsman’s tool kit includes building information modeling (BIM) capabilities. Defining the components of an interior gypsum board partition may not be as simple as it seems. To provide the most cost- and resource-effective solution for non-structural framing—commonly referred to as ‘metal studs’—many performance requirements need to be evaluated for proper material selection. Given the multitude products currently available, this article navigates the various performance requirements that may be required for metal studs.